Russian President Vladimir Putin has said that riots in Kiev have no direct relation to Ukraine and the EU deal, but rather it's an attempt by the opposition to undermine the country's legitimate government. “As far as the events in Ukraine are concerned, to me they don’t look like a revolution, but rather like 'pogrom'. However strange this might seem, in my view it has little to do with Ukrainian-EU relations,” Putin said. Speaking in Yerevan during his official visit to Armenia, Putin argued that the protests in Ukraine had been prepared by the opposition in advance to undermine the legitimate government of the country. 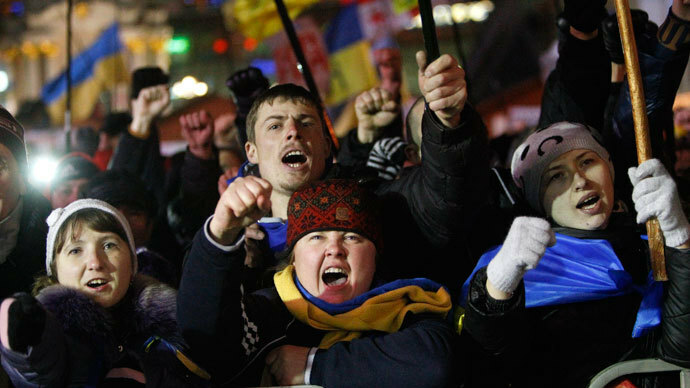 However, it is “apparent” that the opposition had meant them to take place during the Ukrainian presidential campaign in March 2015, the Russian President said. “What is happening now is a little false start due to certain circumstances… This all has been prepared for the presidential election. And that these were preparations, in my opinion, is an apparent fact for all objective observers,” Putin stressed. He has said that now the Ukrainian opposition is either not in control of the protests, or it may serve as a cover-up for extremist activities. 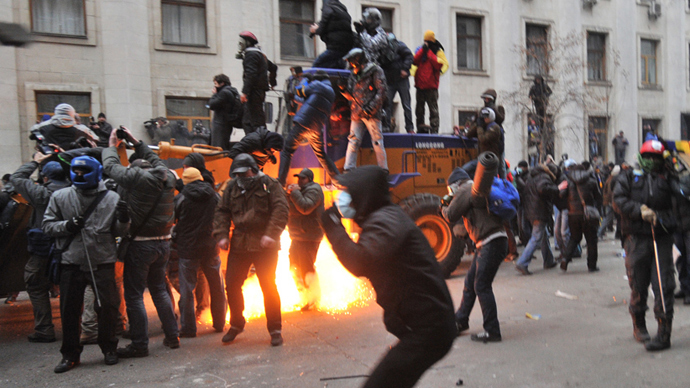 The footage from Kiev clearly shows “how well-organized and trained militant groups operate,” the Russian President said. Nobody seems to be concerned with the actual details of the Ukrainian-EU agreement, Putin said. 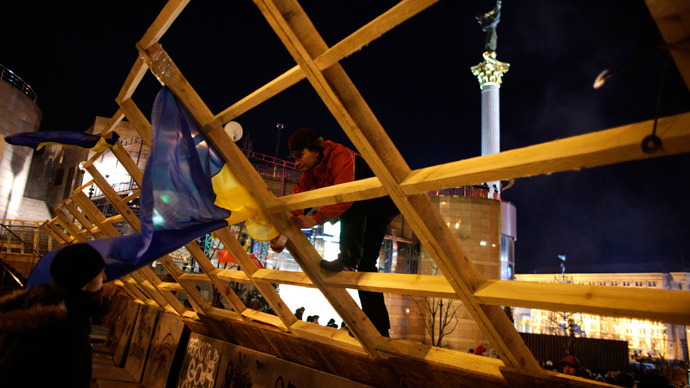 “They say that the Ukrainian people are being deprived of their dream. But if you look at the contents of the deal – then you’ll see that the dream may be good, but many may not live to see it,” he argued. Putin then explained that the deal offered to Ukraine by the EU has “very harsh conditions". The Russian government presumes that the situation in Ukraine will be back to normal, and that the Ukrainian government and the Ukrainian people will determine their future on their own. “I want to stress that, regardless of the choice of the Ukrainian people, we will respect it,” Putin said. The Ukrainian authorities see “signs of a coup” in the attempts to block the government agencies by the protesters, but are exercising restraint, Prime Minister Nikolay Azarov said during a meeting with ambassadors from EU states and the US in Kiev. 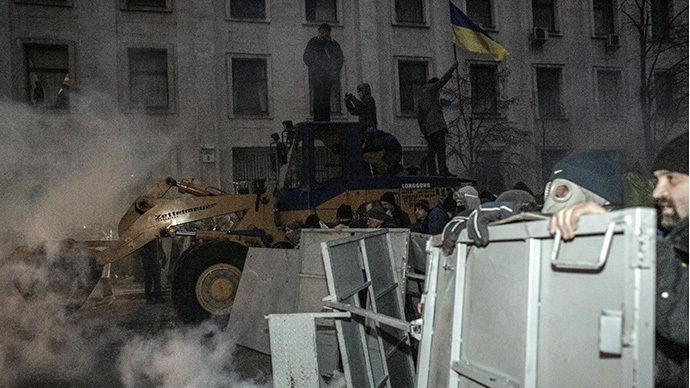 Azarov said that some political forces have “an illusion” that they can topple the government, adding that the opposition is developing a plan, which involves taking the Ukrainian parliament building by force. “Things have changed. On the one hand, we aren’t exonerating the law enforcement agencies, but on the other hand, politicians who are joining the action now are dramatically radicalizing the situation. The mass character of the action became uncontrollable or rather controlled by certain political forces,” the Ukrainian Prime Minister was cited as saying by RIA Novosti. He then assured the diplomats that the government guarantees that force won’t be used against peaceful demonstrators in the capital, and that the necessary orders to the police not to use such force have been given. The Ukrainian authorities are expecting that the opposition will also abstain from provocation, he added. Azarov told the diplomats that Ukraine has proposed some changes to the association agreement with the EU. “We’d like to discuss the provisions, which bother us. We’d like our initiative to be treated attentively and maybe we’ll be able to achieve compromise,” the Ukrainian Prime Minister stressed. 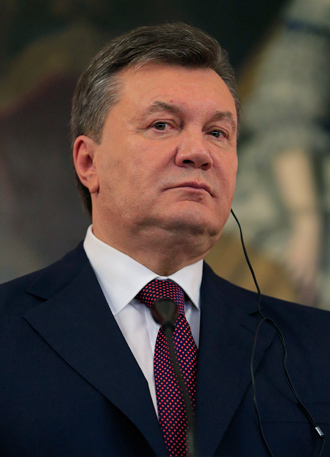 Ukraine will soon resume negotiations with the EU on the conditions of signing an Association Agreement, Yanukovich said after speaking with European Commission President Jose Manuel Barroso on Monday. “[We are] preparing a working group that will travel to Brussels, to begin this dialogue,” he said, adding that he expects the talks to be difficult. “Very difficult this dialogue is, for both sides, because getting back to changing the terms of this agreement is very hard,” said Yanukovich.